What Are the Origins of “Reasonable Doubt”? 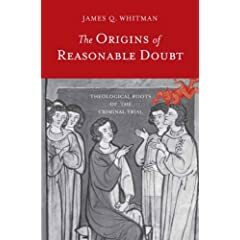 And when it came to that sort of spiritual peril, premodern Christian theology turned in particular on the problem of “doubt.” Doubt was the voice of an uncertain conscience, and it had to be obeyed. “In cases of doubt,” as the standard theological formula ran, “the safer way is not to act at all.” This applied to judging just as it did to all other acts involving the individual conscience. As the standard Christian law explained, “In every case of doubt, where one’s salvation is in peril, one must always take the safer way. . . . A judge who is in doubt must refuse to judge.” A judge who sentenced an accused person to a blood punishment while experiencing “doubt” about guilt committed a mortal sin, and thus put his own salvation at grave risk.